Moles can occur anywhere on your skin. Typically, moles are not a life threatening occurrence. Moles that are of a medical concern are those that are large, bumpy, and/ or discolored. Moles with these characteristics should be checked out by a doctor immediately. If the mole is a superficial problem, there are products such as skin bleach to lighten the moles to the point of non-existence. Some moles are the work of genetics while others occur due to too much exposure to the sun. Heredity and age can even be factors in moles. Uneven distribution of melanin that cluster together produce moles. Melanin is the primary determinate in human skin color. 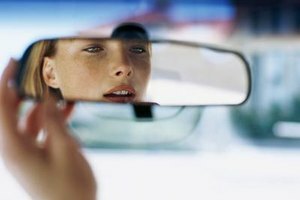 Too much exposure to sunlight may alter the DNA and RNA cells of the skin and produce skin moles that are susceptible to cancer. It is very important that the first step in getting rid of a mole is the doctor's office. As some moles can be a form of cancer, it is extremely important to get any moles checked out by a doctor. 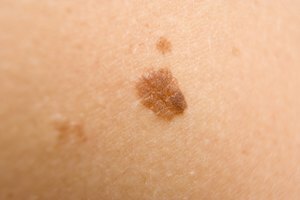 Many times the doctor might want to remove the mole anyways to test it for melanoma. If it is determined that the mole is not harmful, then alternative mole removal techniques can be considered. If a mole is not medically harmful and for one reason or another not going to be removed, there are skin bleach products that you can use to simply lighten the skin in the mole area. It lightens the darkened pigmentation caused by the melanin formation to effortlessly make moles and even freckles less noticeable. Check with your doctor to make sure that this is a viable option. Reactions to use of skin bleach depends on the person and their skin's reaction to the bleaching agent. 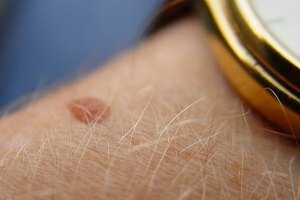 Skin irritation is a possible problem with bleaching skin moles. In some cases, the bleach does not lighten the skin due to a number of unforeseeable factors with your skin. If any issues arise from the bleaching, consult your doctor. The obvious benefit of using skin bleach on a mole is the lightening of the mole. There are products that use chemicals that sometimes react poorly with certain people. Avoid products that contain hydroquinone. There are many products that use natural ingredients that will lighten your mole without damaging your skin.